Kerri & Anthony celebrated their sophisticated black and white wedding at Bellagio Event Venue. 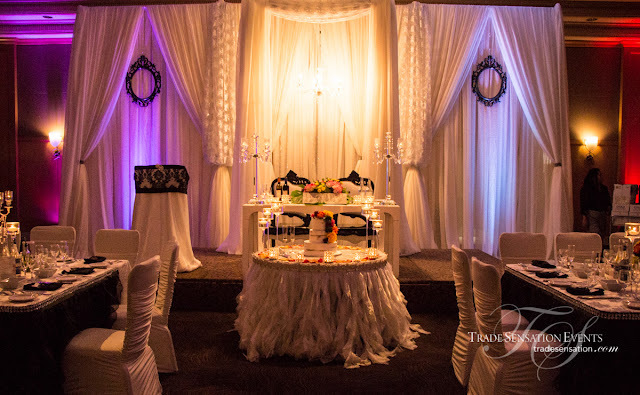 Their decor consisted of silver bling and sequin details that gave the room a little sparkle. Their choice of lush and vibrant floral brightened up the room and gave it a pop of color. Alternating high and low centerpiece arrangements and white candelabras looked beautiful as it lit up the room with a romantic feel. The backdrop with a hanging chandelier and white sheer drapes framed the sweet couple. We are so happy to have been a part of Kerri & Anthony's special day. Trade Sensation Events wishes you a lifetime of laughter and happiness! Anna & Marc celebrated their beautiful wedding in an intimate backyard estate setting. Despite the unstoppable rainy weather, the Trade Sensation Events team was able to quickly and swiftly make adjustments accordingly so that guests were comfortable and enjoyed their evening. Colors for the wedding were silver, white, grey and sequin details. Friends and family gathered this day to show their love and support for this amazing couple. Thank you Anna & Marc for allowing us to be a part of your special day, we wish you the best in your future together! Athena & Akino celebrated their beautiful wedding at the Markland Wood Golf & Country Club. The ceremony was intimate as guests witnessed the love of the head-over-heels couple. Apple green, gold and white were the main colors of this gorgeous wedding. 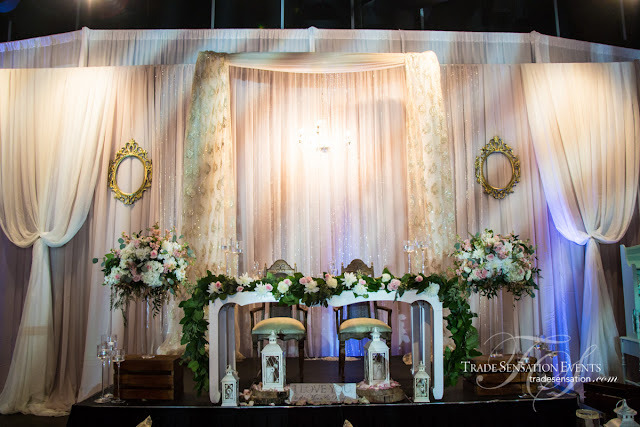 The Trade Sensation Events decor team brought to life the couple's vision. Thank you for having us a part of your special day. Congratulations Athena & Akino, we wish you a lifetime of laughter and love!